I know I just recently posted about the g(Math) Add-on for Google, but it deserves additional attention today as yet another enhancement has been unleashed by John McGowan. Users of this Add-on can now input handwritten responses to Google Forms. g(Math) recently received a huge upgrade by allowing the ability for math expression input into Google Form responses. That may seem pretty spectacular, but it is now overshadowed by the latest enhancement giving users who submit forms the ability to handwrite their responses. I can't express enough how important this Add-on is to Math teachers, especially those at the high school level who think Google can't help them facilitate the level of Math they need to teach to their students. 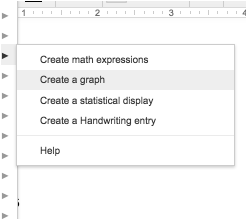 Not only does this Add-on allow for mathematical expression and handwriting input, but also allows for advanced graphing. Give the Add-on a try and if you need help, reference the help site.